I’m writing this article from my sofa, a cup of coffee in front of me and Stage 2 of the Tour of Dubai on TV. Not bad for a day at work. However, I’m typing slowly and with only my left hand. Next to the coffee sits two packets of pills and my right arm rests on an ice pack with a dressing over a surgical incision. 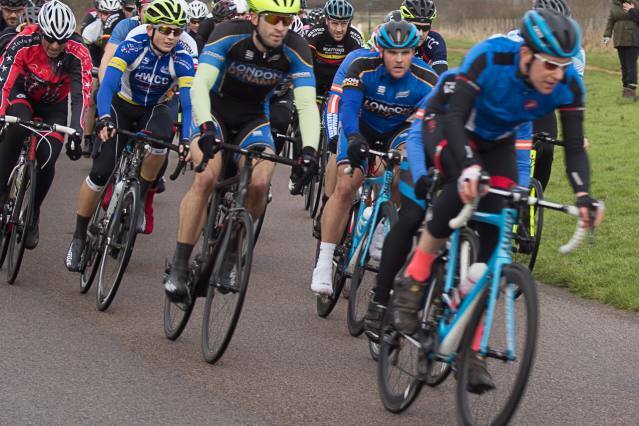 Last week I was taken out by a rider swerving in the pack during the final lap of a criterium. 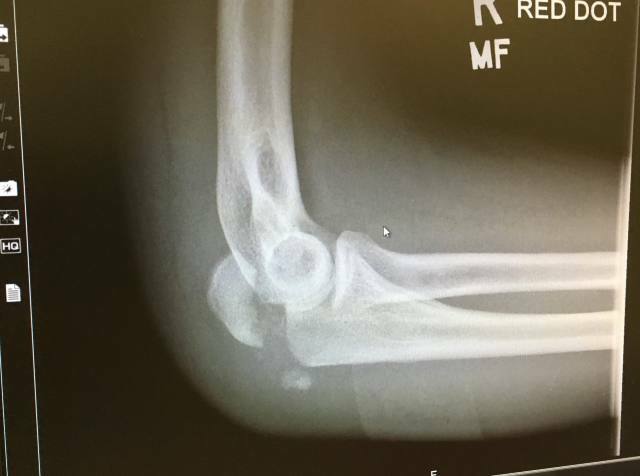 I went down at around 55kmh, breaking my olecranon (the technical name for the pointy bit of the elbow, which is the end of your ulna), sustaining some road rash and smashing up my bike. A&E, x-rays and an operation under general anaesthetic followed. So I’m not at work, this is a day off recovering, but I felt compelled to write this. Why? Because I was completely uninsured for this, despite working on insurance every day. What difference would insurance make? The reason I hadn’t taken out insurance was not because of an “it won’t happen to me” attitude, instead I hadn’t thought enough about the costs related to an accident like this that insurance can cover, nor the better experience that insurance can give you as a result. Damage to the bike – Any damage would have been paid for under ‘accidental damage’ cover as long as the policy included cover for racing and competitions. Importantly, my home insurance (as with most home policies) would not have paid out because I was using the bike at the time – a common exclusion for sports equipment on home policies. Damage to my wheels – These can be really valuable – maybe as much as your frameset. Bikmo and Yellow Jersey will cover them as long as your total sum insured includes their value. 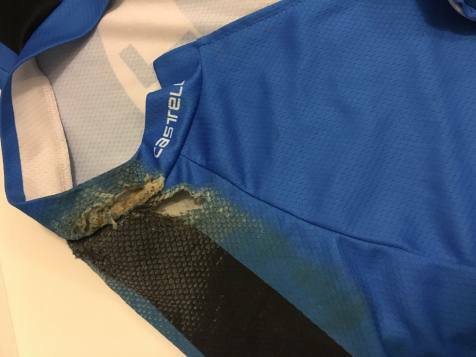 Damage to my accessories and clothing – Surprisingly, my Garmin, helmet and even Lycra (it’s stupidly expensive these days) can be insurerd within the ‘accessories’ cover of many policies. Bikmo includes £250 or 10% of the bike’s value, Yellow Jersey gives £250 of cover and allow more as an option. Race fees – I’ll be out for 3 months and need to cancel future races that I’ve booked. Bikmo and Yellow Jersey include this as standard. Broken bone benefit – PedalSure stands out from the crowd by paying out if you break a bone. Its Silver policy provides £500 for a broken ulna on it's Silver cover and also covers up to £300 on the same policy for out of pocket expenses paid as a direct result of the accident - these two covers would have been a massive help for expenses I’d not anticipated; I needed a cab home on the day, I can’t cook now my arm is in a sling so I’m spending more on takeaways and the boredom factor in recovery is huge so some spare cash to throw at the cinema, or a few kindle books is a well thought-out feature. I’m lucky I’m employed – if I worked for myself, this money would be essential. Physiotherapy – PedalSure also covers £750 of physiotherapy following an injury. In this case I would have been able to book private physiotherapy and avoided the uncertainty and wait for NHS treatment. Liability – Two other riders were brought down in the crash, fortunately neither were hurt and all bikes were intact. But if they’d been injured and if they’d been off work they might have suffered large financial losses and tried to sue. They might have believed the accident was my fault and sued me – this is where the public liability cover of £2m (BikmoPlus, PedalSure and Yellow Jersey) comes in. Dental – PedalSure offer £750 of dental cover on its Silver policy in the event I needed work after the fall (purely cosmetic or aesthetic work is excluded). We've negotiated a 10% discount on BikmoPlus policies. Join our group to get a quote and receive the discount. Earlier surgery – I was operated on 4 days after the diagnosis; this could have been 1 to 2 days through private care. More certainty on appointment times – I knew nothing about my surgery date until the day before the operation. A day’s notice was manageable but I was in limbo for the days before, just waiting for a phone call. Private treatment would have been booked for a specific time and date. More efficient appointments – My return trips to hospital involved whole afternoons or days spent waiting for delayed x-rays and consultants. Private treatment would have seen less queuing. Physio would be immediately available – The NHS waiting list for my area means I’ll be waiting weeks for physiotherapy to help restore a good range of movement to the elbow after the operation. Private cover can include this and it would be available in a matter of days. Time with doctors – Perhaps controversially, I felt the teams in the NHS facility I attended were overstretched. There was very little time to speak with the surgeon after the operation and I left with unanswered questions (no doubt recovering from the anaesthetic meant I forgot some too) – private treatment alleviates this time pressure and allows longer discussions; often private patients are kept in hospital overnight for monitoring, allowing more time for recovery and a clearer head for questions. We've negotiated a 10% discount on cyclist policies from BikmoPlus. Join our group to receive the discount. Find out more about the best insurance for cyclists.